Dr. Lloyd Minor is frustrated. As dean of Stanford University Medical School, he says he can handle the constant cascade of large-scale challenges that come with his job. But what flummoxes him — drives him crazy, in fact — is something that occurs on a much smaller scale every time he examines someone in his clinical practice. Minor cannot get the electronic health record, which provides a medical history of each patient, to work the way he wants. So he spends too much time wrestling with the computer and not enough directly communicating with his patient. He says EHRs now function primarily as documentation for billing and quality reporting rather than as an aid to doctors. Given their cumbersome nature, the EHR, long touted as a way to dramatically improve patient care, often does just the opposite, Minor believes. Many physicians are fed up with the amount of documentation required in EHRs. Many feel they spend more time as data-entry clerks than as doctors. Studies bear that out. Only 27 percent of a doctor’s time is spent with patients — and nearly half is spent on EHR and desk work, according to a 2016 study published in Annals of Internal Medicine. The study looked at physicians in family practice, internal medicine, cardiology and orthopedics. A smaller study published in April by Health Affairs, focusing on primary care physicians, also found about a 50-50 split in direct patient care time versus desktop medicine. When doctors do spend time in the exam room with patients, they spent 37 percent of that time looking at the computer, the 2016 study estimated. It’s not just recording the patient’s medical information that takes up time, according to Dr. Albert Chan, a family practice physician and the chief of digital patient experience for the Sutter Health Network. Doctors now need to report a series of quality measurements, provide proper insurance coding, and introduce more legalistic wording into the EHR to prevent lawsuits, he says. There’s so much required paperwork and documentation now that primary care physicians spend an estimated one to two hours every night after work finishing up their data entry on EHRs, the study in Annals of Internal Medicine found. In the business, that’s called “pajama time.” In the real world, it’s called one reason for burnout. Fifty-four percent of physicians reported at least one symptom of burnout, according to a recent Mayo Clinic study. A separate Mayo study found that a higher risk of burnout was linked to frustrations with the data-entry workload of EHRs. When the Affordable Care Act and the 2009 HITECH Act required electronic health records to be incorporated into medical practices, Dr. Chan says, many medical groups and physicians rushed to install EHR systems. That means the search function may not work well, or the system may require multiple keystrokes and screens to accomplish common tasks. But, Chan says, as flawed as the EHR is, it would be wise not to throw the baby out with the bathwater. Chan says he would never want to go back to the paper-only era. Current design problems can be corrected over time by EHR system vendors, Chan says, and he expects the furor over EHRs to dissipate as annoying and time-consuming glitches are altered. One of the big complaints doctors have had is the lack of interoperability between EHR systems, so that hospitals, medical groups, insurers and physicians can’t easily share patient data with each other. 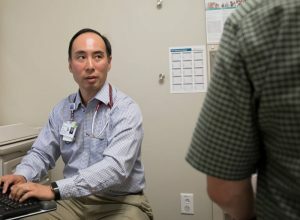 In the San Francisco Bay Area, some sharing is now starting to occur among institutions like Sutter Health, Kaiser, UCSF and Stanford that all that use the EHR system Epic. “We’re starting to see fruits of our labor to connect data,” Chan says. But that may be a glass-half-full view, according to Will Ross, a project manager at Redwood MedNet, a nonprofit health information exchange based in Ukiah. Ross has been working on trying to improve the interoperability of EHRs for two decades, and says the progress has been plodding, to say the least. Ross says EHRs took a turn for the worse after Congress tried to get physicians to prove they were meaningfully using them in the HITECH Act of 2009. Those rules, which he calls arbitrary, made the whole process much more complex and time-consuming. “That transformed all of this into busy work and nonsense,” Ross says. The obvious solution is for vendors to improve their products, he says. But that’s easier proposed than accomplished. Even if the complex problems of interoperability and ease of use were magically solved today, physicians would still be overloaded by reporting requirements, Ross says. Large organizations such as Kaiser and Sutter Health have tackled some of the ease-of-use problems of the EHR, according to David Lansky, executive director of the Pacific Business Group on Health, a nonprofit consortium of private businesses and public agencies. That’s not so easy for smaller practices to do. Lansky’s organization is encouraging smaller groups to join provider contracting networks — niche companies that will help them track patients, install reminder systems, streamline quality reporting and connect with health information exchanges — so smaller practices are not trying to solve the problem themselves. That rings true for Stanford medical school’s Dean Minor. He’s sick of scrolling down page by page; sick of checking off a million little boxes. All the time spent on medical documentation cuts down on physician efficiency, he says. If doctors are working so many extra hours entering data, they’re likely to cut down on their patient load to make up for it. That means they make less money, and the quality of patient visits continues to decline. “It negatively impacts patient care, that’s the main thing,” he says. This report was produced by KQED’s Future of You. You can view the original report on its website.